This is the final report from Tom Boellstorff and his team of researchers regarding online shopping habits, social media practices, and mobile phone use among Indonesians. This IMTFI study received funding from sicap, a Swiss-based organization that provides software solutions for mobile network operators. To see an earlier post about the preliminary findings from this study, click here. Fried Bananas Online. 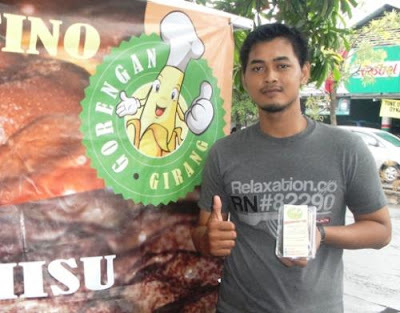 Ahmad Lutfi Amrullah, a fried bananas trader in Surabaya, grew his business using Facebook and Twitter. Photo credit SP/Nur Fajaruddin. Mobile devices have definitively displaced desktop computers for commerce (and other uses), but laptops remain important. Indonesians tend to follow specific pathways into electronic commerce that can move across platforms and be identity-specific. Multiple device ownership is nearly universal in Indonesia (often four to six devices), and this is linked to particular practices of online consumerism and payment. BlackBerry is the dominant mobile device for Indonesians when shopping online, so much so that it is treated as a category of device unto itself, distinct from other smartphones. Providers and websites are extremely important to online shopping and payment, and are the primary factor driving multiple device ownership. Place-making is an important aspect of the intersection of (1) smartphones; (2) social network sites; and (3) purchasing and selling online in Indonesia, but often this involves localizing effects (for instance, using a smartphone and social network site to order snacks from a food stall at the end of the block). Experiences in buying online often lead to forms of online selling, with a wide range of formality and linkage to social networks. Risk is an ever-present aspect of online buying, but is often treated as a “risk of shopping” via the internet and addressed through various social and technological strategies. Tom Boellstorff is Professor of Anthropology at the University of California, Irvine. His research interests include contemporary Indonesian society (where he has conducted ethnographic research since 1992) and digital culture. His books, among others, include Coming of Age in Second Life: An Anthropologist Explores the Virtually Human (2008) and with Bonnie Nardi, Celia Pearce, and T.L. Taylor, Ethnography and Virtual Worlds: a Handbook of Method (2012).